Editor’s Note: This is the third in a series of blogs about charities that use postcards to solicit donations of clothing and household goods for home pick-up here in the East Bay. The previous United Cancer Research Society blog was about a charity with a long history of collecting tens of millions of dollars in the name of cancer research while only a tiny fraction of a percent was ever used for charitable purposes. The Disabled American Veterans' “California Rehabilitation Foundation”, which was here in Oakland last week collecting goods to be “sold in our Pomona, CA thrift store or wholesaled to private thrift stores”, isn't deserving of similar scorn. The two worst performing categories are Veterans & Military and Crime & Fire Prevention. While most categories have a preponderance of charities with A and B grades, 75 percent of the groups in these two categories earn D’s and F’s. It is a national disgrace that hundreds of millions of dollars raised in the name of injured veterans, police and firefighters are being squandered. The report card for the charities in the above categories did include the Disabled American Veterans, (which received a D) but there are hundreds, if not thousands, of individual DAV chapters throughout the United States and they all file separate returns. Therefore, for the California DAV Rehabilitation Foundation, we’ll have to rely primarily on their 990 Forms which are available online compliments of Pro Publica. Right off the bat, the foundation gets props in that neither the Director, nor members of the Board, are salaried as opposed to the aforementioned Cancer Research Society that paid its Treasurer $285,000 for calendar year 2010. In their 2013 tax return, DAV reported $1.97 million in income from sales of inventory from donated goods. To fulfill their “Program Service” requirements, they cited $472,500 in grants - mostly to other DAV organizations but $355,000 stayed with their own office in Santa Fe Springs. Other major expenses included $519,000 for “Cost of Goods Sold” - which would suggest that they paid for additional merchandise, or what is more likely, paid for the services of a commercial fundraiser that mailed the postcards and then picked up and distributed the goods. Another major expense was $249,000 for a “Management Fee” paid to “California Management” at 85A Galli Drive in Novato, CA. Combined they grossed a total of $12,744,883. The non-profits in whose name donations were collected received $2,924,805 or just under 23%. Here’s the kicker: J. Mann owns and operates six for-profit, “Eco-Thrift” shops and also manages the “Veteran’s Thrift” in Pasadena that is owned by the ADA. Without a thorough audit (which the American Institute of Philanthropy insists is the only true measure of a charity), we can only postulate as to who profited and to what extent. So here’s our guess: The $249,000 “Management Fee” almost certainly went to J. Mann and the $519,000 for “Cost of Goods Sold” probably to J. Mann, as well. In addition, the goods collected in Northern California almost certainly ended up being purchased "wholesale" from DVA and then sold retail in the Eco-Thrift shops in Hayward, Stockton and Vallejo. What we can say with certainty is that none of the clothing or household goods that well-meaning Oakland residents donated last week ended up staying here where it would be available for distribution to the homeless or for resale in local non-profit thrift shops to Oakland residents on a limited budget. It’s also safe to say that the DAV’s Rehabilitation Foundation received a relatively small percentage of the proceeds from the sale of donated goods and that none of those funds ended up serving Oakland’s own veteran community. If you specifically want to help Oakland's homeless veterans, we highly recommend Operation Dignity which has been providing desperately needed services for the past twenty years. Currently, that includes a Mobile Assistance Van and 136 units of transitional housing with more in the pipeline. They always welcome donations of warm clothing, socks, underwear and sleeping bags. As a matter of course, for future donations of clothing and household goods, DonateOakland.org’s mantra continues to be “Keep it Local” by supporting our list of approved non-profits. Today’s blog was prompted by a postcard from the United Cancer Research Society which was first recognized by the IRS as a non-profit in 1974. It is the second in a series of blogs reporting on nonprofits that use such cards to solicit donations of clothing and household goods to be picked up by their driver at a later date. Without all the necessary expertise and background information, evaluating UCRS is a bit complicated since they have their own thrift store in Redlands, CA; also solicit donations in the form of cash and annuities; and also contract with commercial fundraisers who solicit donations of salvageable goods on their behalf. On the other hand, there’s reams of information available online that help confirm that it is far wiser to donate to LOCAL NON-PROFITS whom you can trust. As this UCRS mailer and pick up service is likely coordinated by a commercial fundraiser, we’ll focus initially on their role. 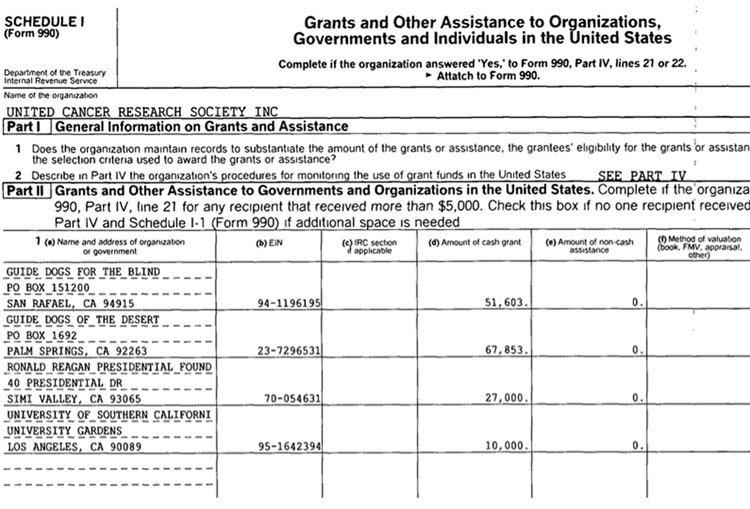 A California Attorney General report on Commercial Fundraising for the 2012 calendar year identified KKA Enterprises as a Fundraiser for UCRS. That year, KKA reported $3.78 million dollars in revenue - of which, UCRS received $115,000 or 3%. In 2012, the United Cancer Research Society’s sole charitable donations were $12,500 to the Childhood Cancer Foundation of Southern California and $5,000 to the Leukemia and Lymphoma Society. That’s 0.0046% of the original $3.78 million. In previous years, UCRS was a far larger operation. On their 2009 Form 990, they reported $1.45 million in non-cash donations (presumably, salvageable property) and a total of $6.77 million in such donations over the previous five years. For 2009, they claimed $168,456 in grants “to organizations conducting cancer research and developing cancer treatments and other charitable organizations”. However, as shown in the excerpt posted below, none of the top four grantees were cancer related and one of those for $27,000 was to the Ronald Reagan Presidential Foundation. An even earlier report on 1997 fundraising solicitations indicated that UCRS was then represented by Harcourt and Harcourt which earned $2.18 million - of which UCRS received just over $12,000. As an aside, Harcourt and Harcourt is currently based in Coachella, CA at an address they share with the Oasis Thrift Shop that advertises (along with a branch in Beaumont) that “proceeds benefit Fight Cancer Now”. Not coincidentally, Fight Cancer Now also shares the 6th Street address in Coachella. For 2012, they reported $2,286 in revenue and $3,227 in expenses to the IRS. If you're an Oakland resident, chances are that you periodically receive cards in your mailbox requesting donations of clothing and household goods to be placed outside in a visible location that will be picked up by their driver on a specific date. As is the case with the ubiquitous collection bins, DonateOakland.org strongly recommends that you donate instead to one of the local non-profits here in Oakland that provide incredibly valuable services while also offering low-income Oakland residents the opportunity to purchase used goods at affordable prices. Over the next few months, we'll report on such solicitations as they are received. The most recent solicitation for a February 19th pick-up in my neighborhood is for VIETNAM VETERANS OF AMERICA. "In fiscal 2013, CharityWatch's analysis of VVA's tax form and audited financial statements for that year shows the charity spent only 16% of its expenses on programs" while "they reported $24.8 million on solicitation costs for generating the items collected and sales costs for selling the items". The complete analysis from Charity Watch is on THIS LINK. DonateOakland.org's list of local non-profits is HERE.